Jeremy Roebuck at the Philadelphia Inquirer offers a piece on the FBI director's statement that the alleged shooter of a Philadelphia police officer and a confessed supporter of ISIS likely acted alone. 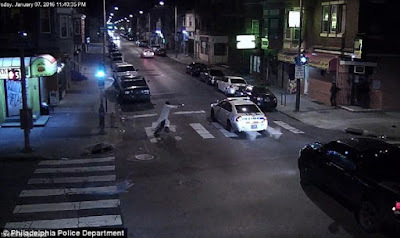 FBI Director James B. Comey said Thursday that investigators were not currently seeking any other suspects in last week's shooting of a Philadelphia police officer by a man who pledged allegiance to the Islamic State. Comey said authorities had found nothing to suggest that confessed shooter Edward Archer was part of an organized terrorist cell or was planning any follow-up attack. He downplayed the significance of an anonymous tip police received Saturday that Archer, 30, of Yeadon, might have worked with three other men whose religious beliefs were more radical. "We're not seeking anybody else," Comey said. "We're going to look very hard to untangle this guy's entire life so we can understand what his motivations might have been."